South Korea's SBS enlists world’s first 12G-SDI UHD OB Van. Seoul, January 2017: [Source: Broadcast Solutions] The OB Van - built by German System Integrator Broadcast Solutions GmbH - is the first ever 12G-SDI UHD single link production vehicle to date. UHD 1 is based on a new Streamline variant, called Alphaline, which comes with special workplace design, room concept and with reduced length in order to cope with the special conditions of South Korean roads. The OB works with up to 12 4K/UHD cameras on the basis of 12G-SDI UHD Single Link and offers sufficient 3G-SDI Quad Link gateways for monitoring purposes. The OB offers sufficient space for teams of up to 18 people working smoothly. 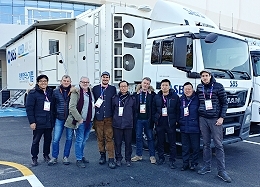 Shortly after commissioning, the OB Van successfully passed its first test when producing the ISU World Cup Short Track Speed Skating competition at Gangneung, South Korea. During development and manufacturing of the OB as well as for support during its first production Broadcast Solutions again teamed up with South Korean partner company DongYang Digital (DYD). Being the first OB Van of its kind worldwide, the SBS OB Van works with 12G-SDI UHD Single Link format, using Ikegami cameras and vision mixers. For video-routing and multiviewers SBS relies on Evertz equipment. The customer’s requirements for a compact yet high-powerful vehicle were realized by Broadcast Solutions’ vast experience in building OB Vans. Because of the OB’s compact dimensions the German System Integrator even more pushes the boundaries in developing up-to-date OB Van designs and solutions. In close cooperation with various manufacturers Broadcast Solutions conceived an OB Van that offers the best of both worlds: a highly advanced yet compact coach building with sophisticated production and room concepts that incorporates the latest broadcast technology for live TV production. The resulting OB Van offers the customer SBS maximum flexibility and is a future-proof production tool. Adding a new member to the Streamline Family of OB Vans the Alphaline OB comes with an exceptional coach building, compact overall measurements and sophisticated room concepts, thus offering a refined global workspace design. Although a more specialized and individualized OB Van, the Alphaline, like the other Streamline OBs, can be delivered in a very short time but without any compromises on technology or durability. For years South Korea is on the forefront of adopting UHD TV. The countrywide establishment of UHD, being the overall standard, was decided by government and regular TV programme is already available. Over the years South Korean broadcaster SBS and Broadcast Solutions strengthen their long lasting relationship and the OB Van delivered is the second Broadcast Solutions OB unit built for the South Korean broadcaster. Previous SBS-Broadcast Solutions projects include the installation of a Satellite HUB Station and delivery two DSNGs with three cameras each.